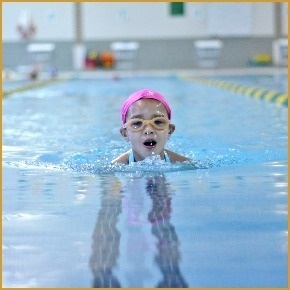 Zodiac Swim School offers the 'Zodiac Learn to Swim' Program. This program has been crafted by us and is endorsed by the Lifesaving Society. This 12 Level program includes learn to swim progressions, fitness, water safety, first aid as well as the first two levels of the Canadian Swim Patrol Program (Rookie Patrol and Ranger Patrol). We know this program will set the stage for your swimmer to learn about and enjoy swimming for life. Swimmers will be introduced to safe entries and exits, rhythmic breathing, submersion and assisted front and back glides. Swimmers will experience buoyancy and movement through the creative use of pool equipment and PFDs (personal flotation devices). As their skill confidence progresses, swimmers will begin to integrate kicking while performing front glides which leads into front swim. In this level, swimmers build on the skills learned in Zodiac Swim Level 1 and will now work toward initiating those skills on their own with little to no assistance from the instructor. Swimmers will develop front and back floats by maintaining a relaxed body position for 3 seconds and attempting to open their eyes underwater. Swimmers will develop their front and back glides and be able to glide independently for 3 meters on their front and 5 meters on their back upon completion of the level. Swimmers are now ready to perform their skills for longer distances. Swimmers will work to achieve their roll over glides completely unassisted. Propulsive arm action is added to the front swim which will be performed for 5 metres. Side glide which is needed for front crawl, is introduced in this level. In this level, swimmers improve their endurance and strength. They work on their front crawl technique, by performing the front glide/slide glide combination for 5 metres, unassisted. This will help them perform a more efficient front crawl for 7 metres. Swimmers are also introduced to a body roll while doing back glide, which is the next step to back crawl. Swimmers will be able to swim 10 metres without stopping upon completion of this level and will have learnt about EMS (911). Swimmers work on improving their endurance to be able to swim 15 metres without stopping as well as treading water for 30 seconds. They are introduced to back crawl, and upon competition of the level will be able to perform back crawl for 10 metres. They are continuing to improve their front crawl and will be able to swim this stroke for 10 metres. Swimmers will also get to learn how to do a front roll and a sitting dive, which is the first progression to a standing dive. Swimmers continue to develop their front crawl and back crawl so they are able to perform them for 15 metres. They are introduced to front and back whip kick, as well as head first sculling on their back. They improve their endurance to be able to swim 25 metres without stopping and are introduced to interval training. The Strokes 5/6 Class is for swimmers who have completed part of either Level 5 or Level 6. No water safety is covered in this class; swimmers work on their level stroke standards as well as fitness items. Swimmers can only complete the level if they have already completed water safety components and have met all the standards. Front and back whip kick technique is improved so that swimmers are able to swim whip kick on their front and on their back for 10 metres. They are introduced to front scull with breathing, which is the next progression for breaststroke. Front crawl and back crawl are becoming more efficient, swimmers will be able perform these strokes for 25 metres, maintaining the Level 7 standards. Swimmers continue to work on their endurance, and will be able to swim 50 metres without stopping as well perform interval training for flutter kick, 4 x 25 metres upon completion of this level. The front crawl distance is increased to 50 metres in Level 8 and a continuous, efficient flutter kick along with a smooth bent-arm pull through the power phase must be achieved. Back crawl for 50 metres must demonstrate a coordinated body roll with alternating arm action throughout. Breaststroke is introduced for 15 metres bringing front sculling and the whip kick on the front together for a coordinated timing of: pull, breathe, kick, glide. Swimmers will be able to complete a 100 metre distance upon completion of the level. The Strokes 7/8 Class is for swimmers who have completed part of either Level 7 or Level 8. No water safety is covered in this class; swimmers work on their level stroke standards as well as fitness items. Swimmers can only complete the level if they have already completed water safety components and have met all the standards. In this level, swimmers are introduced to touch turns, which will help them swim lengths continuously. Front crawl is now performed for 75 meters with touch turns. Back crawl is also performed for 75 meters with the elimination of any hip sway. Breaststroke is performed for 25 meters as a coordinated stroke employing sweeping hands under the chin before the forward acceleration of the stroke. Swimmers are introduced to head up front crawl as well scissor kick (which is another Lifesaving kick). Upon completion of the level, swimmers will be able to swim 100 metres in 3 minutes or better. In this level, swimmers increase their performance of front crawl and back crawl to 100 meters. Breaststroke is increased to 50 metres. Swimmers also work on their head up front crawl and are introduced to travelling eggbeater. Their fitness has increased to be able to swim 300 metres without stopping as well as more interval training. When swimmers complete this level, they will have also earned their Canadian Swim Patrol Rookie Award. The Strokes 9/10 classes are for swimmers who have completed part of either Level 9 or Level 10. No water safety is covered in this class; swimmers work on their level stroke standards as well as fitness items. Swimmers can only complete the level if they have already completed water safety components and have met all the standards. In this level, swimmers build on their touch turn capabilities so they are able to add them when swimming back crawl. Breaststroke is increased to 75 metres, and swimmers are introduced to head up breaststroke for 25 metres. 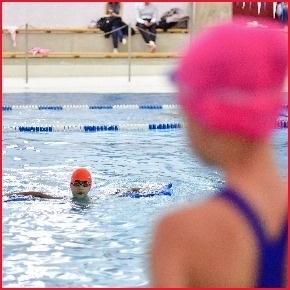 Swimmers improve their Lifesaving Skills by learning about entries with aids, as well as building on primary assessment skills and how to treat an adult victim with a mild or severe airway obstruction who is conscious. Their fitness levels increase to be able to swim 400 metres continuously, as well as being able to swim 200 metres in 6 minutes or less. In this level, swimmers are able to perform proficient front crawl (for 100 metres), back crawl (for 100 metres) and breaststroke for (100 metres), all with touch turns. They are also able to swim head-up breaststroke and front crawl for 50 metres and travel using scissor kick, whip kick on back, as well as inverted scissor kick, all which are Lifesaving kicks. Their fitness level increases to be able to swim 250 metres in 7.5 minutes or less as well as a continuous swim of 500 metres and perform travelling eggbeater with a 5-pound brick for 15 metres. When swimmers complete this level, they will also have earned their Canadian Swim Patrol Ranger Award. 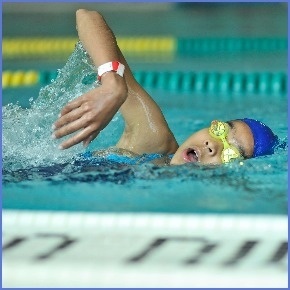 The Strokes 11/12 Classes are for swimmers who have completed part of either Level 11 or Level 12. No water safety is covered in this class; swimmers work on their level stroke standards as well as fitness items. Swimmers can only complete the level if they have already completed water safety components and have met all the standards. An excellent preparation for the Bronze Star award, Star Patrol demands good physical conditioning and lifesaving judgment. Participants develop lifesaving and first aid skills; further refine front crawl, back crawl and breaststroke over 100m each; and complete 600m workouts and a 300m timed swim.